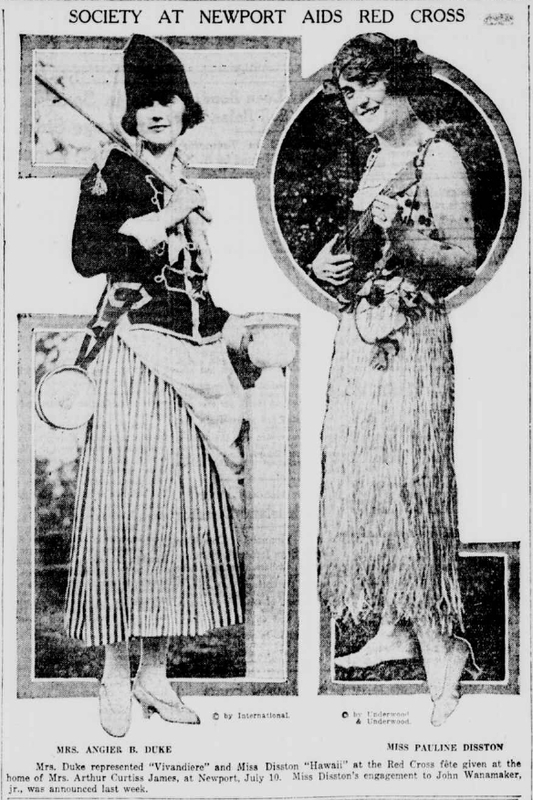 The famous Hawaiian ukulele, which has had a lot to answer for, has made at least two loving hearts happy in the persons of Assunta Di Gullio, fifteen years old, of 508 South Bancroft Street, and Michael Perna, twenty-two years old, of 1525 South Juniper Street. They are now Mr and Mrs Perna after a long series of misadventures culminating in their marriage by Magistrate Harris. Assunta, an unusually pretty Italian girl, lived with her father, Rocco, who did not like the attentions of Michael, although the daughter did. Perhaps it was because he played the ukulele (Michael, not Rocco). At any rate, the music made a great hit with Assunta and she wanted Michael. They knew that the girl’s father would not have it, so last Sunday, Michael took his ukulele and Assunta to Wilmington, where he got a license and they settled down to wait for the necessary forty-eight hours to elapse before they could be married. In the meantime, father Rocco missed the dulcet strains of the ukulele. He also missed Assunta and Michael, and got his friend, James Julian, a private detective, to look the missing trio up. Julian has a sister living at 1903 West fourth Street, Wilmington, and thither the father and the sleuth went, arriving about two hours before the forty-eight hours were up, much to the sorrow of the two elopers, who were soon located. They were arrested and the four started back to Philadelphia, still accompanied by the ukulele. On the way up to this city Assunta used her black eyes and winning ways on her father to such good effect that before the city was reached father had consented to overlook the ukulele proclivities of Michael and consented to the marriage. Then they found out that they only had a Wilmington license and had to hunt another. Finally the two hearts were made one by Magistrate Harris, and Michael, tucking his ukulele and his Assunta under his arm, went happily away on his delayed honeymoon. A story by Jack London, author of The Call of the Wild, appeared in The Evening Post (New Zealand) on Saturday, 22 June 1912, page 10. The story was called “Koolau the Leper”, and it’s not an overly happy one. From one of the rocky lairs calabashes were produced and passed around. The calabashes were filled with the fierce distillation of the root of the ti-plant; and as the liquid fire coursed through them and mounted to their brains they thought themselves men and women once more. The woman who wept scalding tears from open eye-pits was indeed a woman apulse [sic] with life as she plucked the strings of an ukulele and lifted her voice in a barbaric love-call such as might have come from the dark forest depths of the primeval world. The air tingled with her cry, softly imperious and seductive. Upon a mat, timing his rhythm to the woman’s song, Kiloliana danced. It was unmistakable. Love danced in all his movements, and next, dancing with him on the mat, was a woman, whose heavy hips and generous breast gave the lie to her diseased-corroded face. It was a dance of the living dead, for in their disintegrating bodies life still loved and longed. Ever the woman whose sightless eyes ran scalding tears chanted her love-cry, ever the dancers danced of love in the warm night, and ever the calabashes went around till in all their brains were maggots crawling of memory and desire.